Research shows that more than half of all Canadian households do not regularly check the expiry dates of medications, and if they do, they only do it right before taking the product. Given it's now cold and flu season, it's the perfect time to clean out your medicine cabinet. To make sure your medicine cabinet is stocked and ready at all times, follow these simple steps. Victor Wong Owner of two Shoppers Drug Mart pharmacies, TA at U of T Faculty of Pharmacy and Chief Examiner at the Pharmacy Examining Board of Canada. 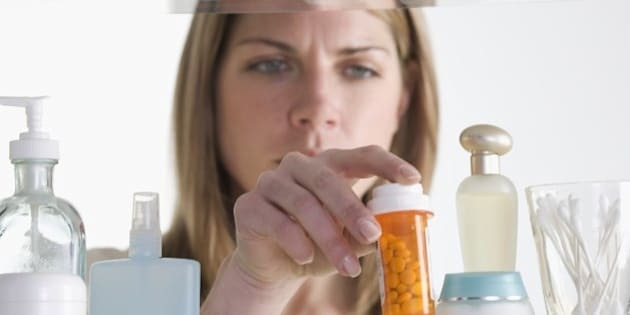 Research shows that more than half of all Canadian households do not regularly check the expiry dates of medications, and if they do, they only do it right before taking the product. Given it's now cold and flu season, it's the perfect time to clean out your medicine cabinet and stock up on what you need to manage the bugs you come into contact with this time of year. 1. Set a date: The best way to make sure you're checking the expiry dates of your medications frequently is to set a date and stick to it. Doing a quarterly check (once every three months) will ensure you know what you have available and what you need to replace. If you notice that something will be expiring before your next quarterly check, it's time to re-stock! 2. Keep medications in their original vial: Don't mix medications together, or put them in unmarked bottles. If you toss the original container you won't know if a medication is expired, putting you and your family at risk. 3. Storage settings: Before you place your prescription in the medicine cabinet take a minute to review its storage instructions. Some medications need to be stored in a cool dark place which may not suit your bathroom! If you do not follow the storage instructions your medications may lose their effectiveness. 4. Keep kids in mind: Make sure all medications are out of reach from children. Ideally, put a child lock on your medicine cabinet. If that's not possible, when cleaning out your medicine cabinet make sure you're taking note of whether the medication containers are child proof or not -- you may need to store some medications in a less accessible location. 5. Don't keep it if you don't need it: If you do not finish a prescribed medication do not keep it for later use. Medications are meant for a specific use at a specific time and taking them at a later date (or a different person taking them) could harm the user. 6. Get with the times: Make sure the tools you have are still the best option. Depending on when you last cleaned out your medicine cabinet you may have things that could put you at risk. Mercury thermometers, for example, are no longer recommended due to the risk of exposure to mercury or mercury vapour if it breaks. 7. Make a list, check it twice: Keep a list of the prescriptions and medications you have on hand. Include details such as the medication's active ingredients, the purpose or reason for taking the medication as well as the recommended dosage. And, don't forget to keep it up to date by removing medicine you're no longer taking and adding new prescriptions to your list. If you are managing multiple medications at a time, it's also wise to take your list with you each time you visit your GP or local pharmacist. 8. Direct Disposal: Expired medications can be harmful if taken so remember to dispose of them properly to ensure no one gets hurt! Collect expired medications in a bag and take them to your local pharmacy to have them disposed of safely. With cold and flu season knocking on the door, why not do your first quarterly medicine cabinet cleanup right now? Being prepared means you have what you need available at all times, so don't wait until you finish that last pill before you go to your local pharmacy to stock up! You'll be thankful you did if you or one of your family members gets sick this season.